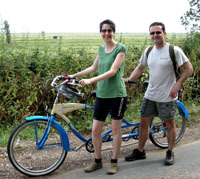 we hired a tandem bike for our week off in Kent and had a great time wizzing down country lanes in the sunshine. We found some lovely beaches, a massive power station (which Hugh was very excited about) and lots of tractors! We cycled about 70 miles in four days which was great but quite tiring on our bums! Oh, we also found this giant seagull in Folkstone with a person inside! Wierd! 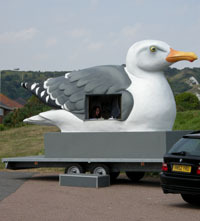 Giant seagull on wheels with woman inside! 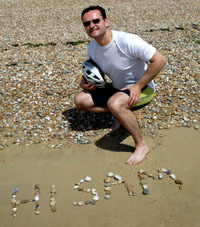 Unfortunately we forgot to take our Hi Sam sign so we had to make one with pebbles on the beach. I’m Carolyn, Madeleine’s mum. 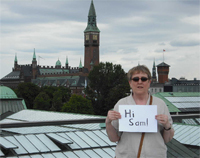 The is a picture of me in Copenhagen in Denmark. I’m on the roof terrace of the Carlsberg Art Gallery It’s called after a famous make of beer because the company that makes the beer paid for the gallery! The big building behind me with the clock tower is the Town Hall. After I’d looked round the art gallery. I went to a place called the Tivoli Gardens, where two of the friends I was with went a on a really scary ride. It looks a bit like spider. There’s a very tall pole, with arms sticking out of it, and long chains hanging from the arms. At the bottom of each pair of chains is a swing seat. People sit on the swings, and then the pole twists round and round very fast, so that the seats swing out sideways. Oh, and the arms go up very high in the air, so that the people are a long way from the ground. I was glad it wasn’t me up there, because I don’t like heights. It was very exciting to watch, though!